Our range of eco-friendly furniture is made from a mix of reclaimed and re-used timber from India, including teak, sheesham, and mango wood. Because the furniture is made from wood salvaged from different sources, it can come in a mix of original colours: usually blues, greens, and creams and sometimes oranges, red and pinks. So even very similar items can look completely different. The wood and timber chosen to make the furniture has been salvaged from old Indian buildings such as factories and havelis that are being demolished, and therefore this furniture is a fantastic environmentally friendly option – in India, the craftsmen are adept at re-using wood that would otherwise go to waste. All items are handmade in Jodhpur, Rajasthan. Due to the nature of the range, each piece is unique and colours will vary from one piece of furniture to another. Please contact us if you would like to see more photos of your item prior to purchase. 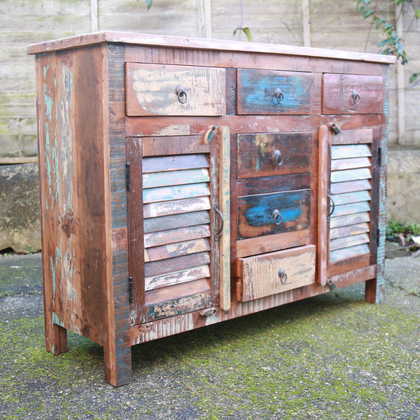 Take a look at our ‘Reclaimed Wood Indian Furniture’ here. This entry was posted in Style and tagged Reclaimed Wood Indian Furniture.